Grace and peace to you from God our creator and our Lord and Savior Jesus who is the Christ; will y’all pray with me? May the words of my mouth and the meditations of all our hearts be acceptable in your sight, amen! So, whenever you set well and good intentions, obstacles are bound to crop up. Case in point, you may have said before Lent began that – you know… I’m going to focus on the joy of Lent to remember and recognize God’s goodness and grace during this penitential season. Then, you might be a little stumped when the third Sunday in Lent’s assigned gospel reading is titled – REPENT OR PERISH! No one said giving something up, or taking something on during Lent would be easy. But, even in the midst of things that seem so dire and absolute, I believe there is still joy to be found. This Sunday, we are confronted with Jesus’ words amidst a long sermon he is giving to the multitudes and crowds that are gathered around him. His words are directed at his close followers, curious on-lookers, indignant religious authorities, and those faithful who will follow him only because of his Word and the shared Gospel to them thousands of years later (you and I). His message to those gathered around him this day – and to each of us – is don’t feel that you are so special that you’re better than those ‘others’ you like to malign, shame, and chastise. Jesus is matter of fact, change your ways, turn back to God, return to the life that God has created for you. There are consequences to living away from God’s truth and life. Jesus calls to his followers – all of us – that living in his light induces a change in behavior and life. A life that is lived in and for God’s glory. A life where we continually repent – turn back from the things we’ve done – so that we can live fully into the life that God has freed us for. A life that is in service to God and neighbor. A life that welcomes all in love and grace. A life that is focused on forgiveness and mercy. A life that is shared with and for all. It was a radical call to life then, it is a radical call to life now. It’s a life that we still lose sight of, stray from, and times stubbornly oppose in so many myriad ways. But, when we look at only what Jesus says in the first part of this reading, we might get a little wary of how our life is going. Jesus seems to imply that this is a one and done thing. Repent or perish. Do it now. Just turn back. Why haven’t you done it yet? Anyone who has ‘given something up’ in their life. Whether it be during the season of Lent, for New Year’s, or just a realization that something in life needs to be done; there is one thing that is readily apparent when those changes in life are made. It’s hard. It isn’t easy. There can be quite a few setbacks as you move to change a habit, end a vice, return to the one who has given you life and love. Well, the good thing here, is that Jesus continues to talk. Because if you’re taken aback by the words he first says in our reading this morning, just imagine what those first hearers of his words were feeling! Jesus is sounding a lot like some of those TV evangelists right about now. Where the ‘returning’ towards God is made out to be easy. Just have faith and it’ll happen. If you fall back, you obviously need a little more faith and prayer. Thankfully, the parable that Jesus shares kind of shoots that philosophy down. This is where I find the joy this third week of Lent. 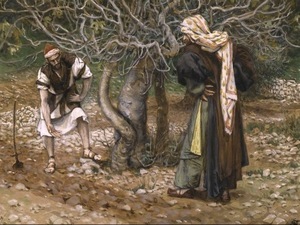 Jesus tells of a landowner who has planted a fig tree and it isn’t producing. That succulent sweet fruit just isn’t making itself known upon the tree, so naturally the landowner wants to remove it. It is wasting space and taking up a plot that an otherwise good tree could be in. Yet, the gardener – the one who actually tends the plants and fields – cautions him and asks that the tree be given another year to produce. But, this time it’ll be fertilized, cared for, and tended to. For many the fig tree can be the life of faith itself – perhaps your own life of faith. It isn’t producing anything, why have it here – it’s just wasting space? But, the parable doesn’t say if or what the landowner has done to cultivate that fruit from the tree. Apparently, he approaches it much like I do with planting – I planted it, I gave it space, grow and produce already! It reminds me of the conversations I’ve had in my ministry with folks who are ‘upset’ or resigned about something in the church that they wish was going on, or something that has fallen to the wayside. As they come with their laments – truthful and honest laments – about youth ministry, or small groups, or a bible study, or a service project – they lament that things aren’t the way they used to be, participation has declined, that it’s just ‘fallen’ these last few years. Just because we want something to happen – even if it’s a good and great thing – doesn’t mean that it is going to happen out of nothing. It takes work, investment, time, involvement, love, and more. You can’t just dig a hole, plant it, and expect it to thrive. In this interpretation, we acknowledge that there is work to do in our own life to cultivate the faith and love that we so desire. Another way of looking at this parable, is to see that the fig tree that doesn’t produce is, in fact, you. It’s me. It’s that other person over there. And that the gardener that comes to vouch for your life is Jesus. He’s the one that is taking the time, investment, love, and heaping a whole bunch of…. fertilizer on you to help you thrive and grow. Jesus is working on you to bear fruit in the life of faith. You’re not a lost cause. You’re not irredeemable. You have hope. There’s joy in that. This doesn’t mean it won’t be difficult. It doesn’t mean it won’t take time. It doesn’t mean that at times you won’t object to where Jesus is leading you. But, our Lord cares enough about you and about me and about that other one over there, to tend to you, walk with you, love you, and lead you in this life of faith. We are continually a work in progress. We are not final. So yes, Jesus says repent or perish this morning. And that seems incredibly harsh and scary. But, the joy of Lent is – that you’re not going to be alone through it. Jesus is there. Jesus is here. Jesus will be with you to help you return towards God. And not only will Jesus be there, but so will your community of faith. Because Jesus is working on the rest of us too. That’s a great joy. Amen.